Join us for a ONE DAY WORKSHOP TO DISCOVER BLUE and CIRCULAR ECONOMY BUSINESS OPPORTUNITIES. The World Economic Forum estimates that 80% of the US$3.2 trillion value of the global consumer good sector is lost irrecoverably each year due to the current inefficient linear 'make, take, waste' model. How much is that worth to your business and or the local economy? With dwindling resources, increased environmental degredation and a growing population, there's never been a better opportunity to advance our thinking by taking a systems approach to business operations and supply chains to ACHIEVE ZERO WASTE and do business better. 3000 of the world's leading scientists have spent more than 20 years providing the Blue Economy with a wealth of smart business development opportunities that turn sustainability into the biggest opportunity since the beginning of money. 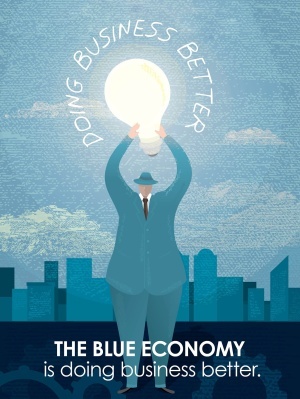 Whether you are responsible for or have an interest in manufacturing, innovation, sustainability, mining, agriculture, disaster management, economic development, education, R&D, entrepreneurship, business/industry or advisory services, the Blue Economy that incorporates the Circular Economy, is here to help guide, inspire and support you, your industry and community. Hosted by Interface (who are already active in the Blue Economy) and leading accountancy firm BDO, and facilitated by Anne-Maree Huxley (1 of only 25 Blue Economy Experts worldwide), this one day workshop will help you, your industry and your community to create jobs and do better, smarter, more efficient and profitable business. For full details DOWNLOAD THE BROCHURE or REGISTER NOW. Tickets: MOSS Members 1 x $395 or 2 for $495. Non Members 1 x $495 or 2 for $595 for non members and includes: GST, morning and afternoon tea, a light lunch, workbook and points towards a certification in a range of qualifications in the Blue Economy (should you wish to do further studies). About The Blue Economy: The Blue Economy (which incorporates the Circular Economy) is about doing business better. It's 100 zero waste innovations are set to generate 100m new jobs in 10 years. By using Blue Economy models, frameworks and principles, MOSS aims to enable a regenerative economy. We will teach the art of execution as well as the bioscience-based innovations that deliver radical systems efficiencies. Privacy - Please note, neither MOSS nor the Blue Economy Institute endorse unsolicited e-mail, nor do we sell our e-mail address list. We do however from time to time identify individuals and or groups who may benefit from a particular event or topic and as such you may receive a one off invitation. To unsubscribe from any mailing simply respond to this email and write unsubscribe in the subject header. If you have been forwarded this invitation from a friend and would like to subscribe and receive our free quarterly newsletter or event invitations please provide your contact details here and you will be added to the mailing list.